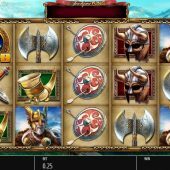 Vikings of Fortune slot joins an increasingly large number of games themed on these Northern raiders such as Play 'n Go's Viking Runecraft and WMS' Viking Vanguard, although you may notice the mechanic has elements of Netent's Jack Hammer. Dramatic and epic music blasts us as we spin and we get a background of a Scandinavian pine forest with mountains in the background and some spectacular animations when the bonus icons land. Our forefathers had a fearsome reputation for pillaging and looting, so can we keep our bankroll safe in the face of this onslaught? A standard 5 reels of 3 rows each host our 20 paying lines but we do get some stacked symbols to increase our chances. 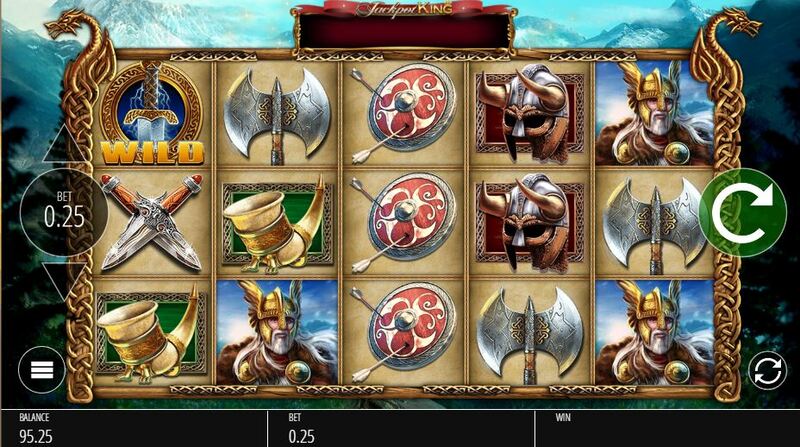 Odin in full battledress pays best at 20x our 25-coin bet for a 5-of-a-kind win followed by Thor at 10x, Valkyrie or Longship at 8x, Horn or Helmet at 4x and Shield, Axe or Sword at 2x for the full line. You do get non-multiplying Wilds though and a huge 400x bet will result if you got the full hit of them! As one would expect on a game that pays some tribute to Microgaming's Thunderstruck 2 there is an opportunity for Thor to show his might which he does with his Thunder Streak Wild on reel 3. When landing this expands and sticks along with any winning symbols from the other reels. You then get re-spins until no more winning symbols are added, and then get paid. This is what you see in the base game of Jack Hammer as mentioned above. So 3 or more Gold Bonus icons in view will trigger a free spins game, but it doesn't start immediately despite awarding you 8 spins. As above, the reels will re-spin until no further Gold Bonus icons appear. If you end up with 4 you get 10 spins, 5 = 12, 6 = 15, 7 = 20, 8 or 9 = 50 and 10+ will award an incredible 100 spins if you have the Norse Gods smiling down on you! I think you may have guessed the enhancement which is that the Thunder Streak Wild appears on every spin. Obviously if you don't get matching symbols on reels 1 and 2 you can't win unlike when it appears in the base game only after matches occur on the first two reels. This could be a long and profitable bonus!